The news about this game has been sitting in my inbox for a while, and I feel bad for never having put some words to it. So now is the time! What are we talking about? Billionaire Banshee: Party Entertainment System, a card game about relationships that might involve unicorns and robots. That game is Billionaire Banshee. It’s a game where everyone playing pretends they’re single & is looking for a soul mate. There are 2 card piles, a Perk pile and Quirk pile. 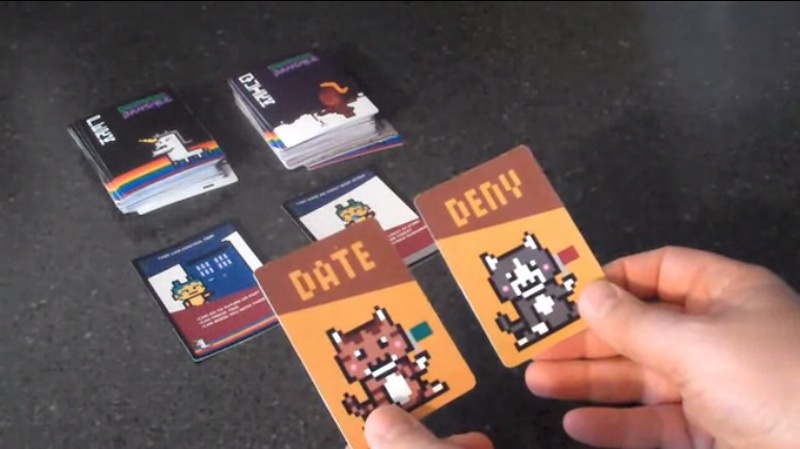 The player who’s turn it is grabs 1 card from each pile and the combination of traits listed makes up their potential lover. For instance: PERK: They Have A Giant Robot QUIRK: They Have Tourettes. Everyone secretly votes if that player would date the weird combination, and those that know their friend best get a point. The game has a bit of an Apples to Apples vibe to it in terms of attempting to determine what your friends would choose based on the cards given, but Banshee‘s focus on relationships will surely incite interesting conversations. This Kickstarter has eight days left and is pretty close to attaining its goal. So check it out if you like card games and spending time with other humans. Thanks for the write up, really appreciate it!